Treasure At Tampines is one of the best-preferred towns to stay in. Tampines townships won the World Habitat Award in the Developed Country Category organised by the Building and Social Housing Foundation (BSHF) of the United Nations. Since the early 1990s, Tampines Town has conscientiously served the Eastern part of Singapore and as the most developed regional centres. A new vibrancy was introduced to Tampines Town is the introduction of Our Tampines Hub – it is the first integrated Community Hub in Singapore. Treasure At Tampines is tapped on many amenities. Tampines Famous Round Market and Tampines Shopping Paradise are walking distance from Treasure At Tampines condo. 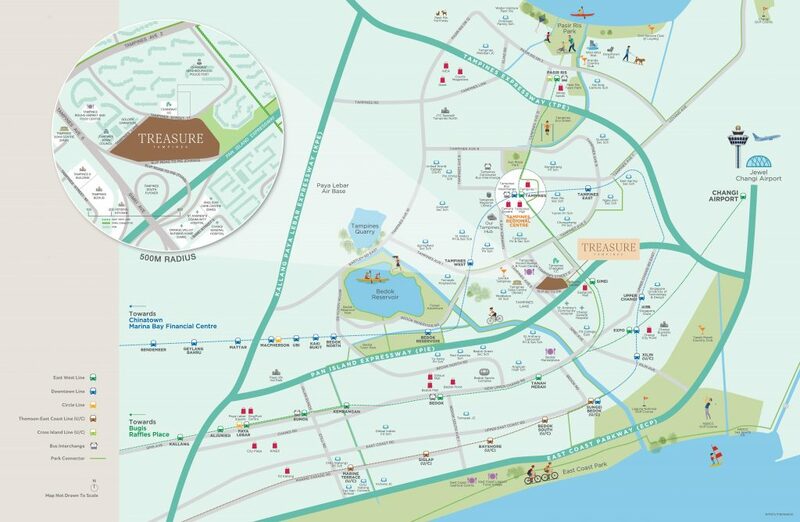 Below listed are the amenities surrounding Treasure At Tampines within the 2km distance range. Excited to know what Treasure At Tampines Price and Treasure At Tampines Balance Units Chart? Click here to find out instantly.